Sanchita is a successful artist and writer who has experienced two episodes of PP. She has published a book about her experiences, Schizophrenics Can Be Good Mothers Too published under the pseudonym Q S Lam (Muswell Hill Press, 2015) and campaigns for better mental health care for mothers worldwide. Although diagnosed with schizoaffective disorder in 2003, I was never forewarned that I would be vulnerable to psychosis. When I found out I was pregnant in 2010, I was based in Brussels and recovering from my second psychotic episode. I thought it would never happen again, that the psychosis was just unfortunate and the result of stress and sleep deprivation. Throughout my pregnancy I saw a psychiatrist who knew about my mental health history, but she never explained that I might be vulnerable to maternal mental health problems after giving birth. When postpartum psychosis struck it was a shock and happened very quickly three days after birth. My birth was swift and relatively straightforward, but I believe the problems started because my sleep was disrupted by a flow of midwives and doctors who kept on waking me up. Perhaps if I had been allowed to sleep after giving birth the episode would not have been so acute. The first hallucination that I had was terrifying which involved visions of me harming my newborn baby. However, because of my experience of psychosis I recognised all the symptoms: racing thoughts, amplified sounds, inability to sleep, talking fast and hallucinations. When I realised something was wrong I requested that I was not left alone with the baby, which was sensible, and I was encouraged to pump my milk in order that I could sleep. It took two weeks for a Mother and Baby Unit place to be found for me. When I finally went home, I still was experiencing visions and still lapsing, but because I recognised the symptoms I was able to inform those around me and also mentally try to ignore what was happening. Sleep was critical to aid my recovery. I didn’t talk about what happened to me for a long time because it was so traumatic, I kept it all in, when I did finally divulge my story, other mothers looked alarmed and just couldn’t comprehend that I had visions to harm myself and my baby, but this is exactly what I experienced. My strategy was to fire bullets of logic back as the visions came hurtling towards me. I developed strategies to cope, such as drawing my baby as I breastfed to divert my mind, going for walks or bike rides in the park. But mentally it all took its toll. Because of my PP experience, I felt different from the other mothers. When I became pregnant with my second baby I was determined to get the right care and support. Unfortunately I encountered many problems and obstacles, but in the end, I found a reputable hospital and an empathetic obstetrician. Again I had an easy, quick and relatively pain free birth, I was monitored, but again despite the efforts of the hospital staff, my sleep became disrupted. The symptoms all started like clockwork, I recognised them straight away and relayed them to the psychiatrist and she told me that what I was experiencing were the symptoms of PP. I stayed in hospital for 10 days before being discharged. My breastfeeding was established and my milk flow was good. My main problem was that my husband was abroad for prolonged periods of time and now I had a newborn and a three-year-old. The visions started predictably, about 30 times a day; I tried to handle them as they kept coming at me. My baby was a voracious feeder and I was exhausted. There is no doubt I needed more help and support and it was a very difficult time, but somehow I pulled through This second episode was different from my first experience. I would describe it as mini episodes that were shocking and traumatic but not as prolonged or entrenched as the first bout of PP. 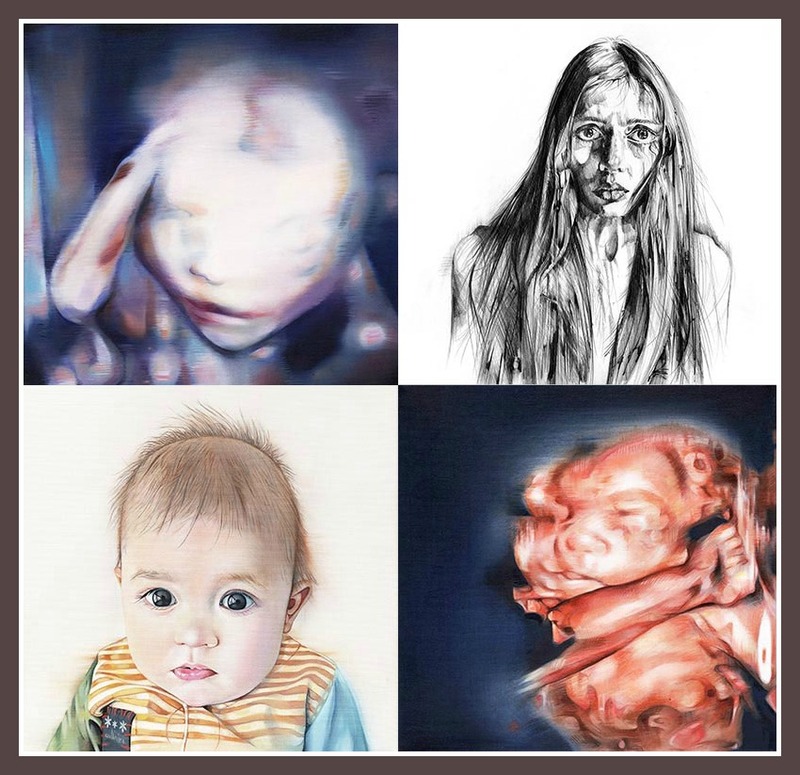 Writing and making art has helped my recovery and I started writing my book, Schizophrenics Can Be Good Mothers Too in 2012, which recounts my experience of psychosis. My main motivation was because I didn’t want another mother to go through what I had. Currently I am working on my 10th book, for children. Regularly I blog for the Huffington Post and I am also campaigning for better mental health for all women and children born to mothers with mental health problems. It is fair to say the impact of postpartum psychosis on my life has been profound. My husband didn’t get the support he needed to deal with it and it is very important that partners and family get that support. Although I would say I have recovered now from PP, I still have to deal my ongoing mental health condition day-to-day and that impacts on my life and my relationship with my children, too. For some mothers who live far from friends and family, it’s hard to get the specified help required to deal with the complexities of PP. Mentally I am quite resilient and the fact that I also teach Pilates and observe my diet and know how to meditate - all that helps. PP leaves a stain of residual guilt on your consciousness, but it is important to move on, not to dwell, to live in the now and focus on the times with your children that are good. I have started teaching mental health skills to my children early. At times it can be a struggle, especially if I am unable to sleep. All mothers have their moments, but when you have a mental health issue perhaps it becomes magnified disproportionately in your head. The most important thing is to try not to be haunted by the PP to tell yourself that what you were experiencing were mental aberrations and that it was not your fault. By exonerating yourself and accepting the PP you can slowly rebuild and have a healthy, loving relationship with your children. It’s a long process - well it has been for me. Because of my ongoing schizoaffective disorder I have a voice in my head trying to undermine all my efforts. Words and art are my ammunition. I keep writing and I keep making art and I keep trying to make a small difference. Altruism is one of the best tonics for a broken mind and so this is how I rationalise all that has happened, perhaps it was meant to happen so that I could help others, especially mothers in the poorest regions of the world. Since I have worked in developing countries with marginalised groups it feels like a natural progression to try to help mothers in parts of the world that do not have access to doctors, psychiatrists or proper care when faced with postnatal mental health issues. When I had PP, I did not know about Action on Postpartum Psychosis, but I have since read the information APP provides and I think it is concise, clear and helpful. APP offers an important service to women and that needs to be supported; perhaps in Asia a similar organisation might be formed to supply information for PP sufferers in this region. Something to think about for the future. Sanchita says: "Not finished this drawing, but this is the preliminary study for the third oil painting of my son. It will be a series of 18 portraits of each of my children. It's fascinating seeing them change and evolve. A drawing captures something a photo never could and I appreciate their beauty and personality even more. I can't wait to see all 18 as one giant portrait, some people have said I should continue beyond 18. Well, we will see. I don't really know how I draw the way that I do, it's like alchemy... but I do like it, my breathing slows down and I go into a meditative state, the action of my hand moving is very soothing and it's empowering to transform a blank piece of universe into an image that has a soul and is alive. The weirdest thing is when I am done and I look at the drawing or painting I really am bewildered and always wonder, 'How the hell did I do that?' Creativity is a compulsion and a mystery. When you suffer from prenatal depression and I am talking about feeling suicidal during your pregnancies (which was the case with me), feeling nothing when you go to the scans, feeling nothing when your babies are born and then are hit with the sledge hammer that is postpartum psychosis, where you have multiple visions to kill yourself and harm your precious newborns, you feel shame, not worthy to be a mother. 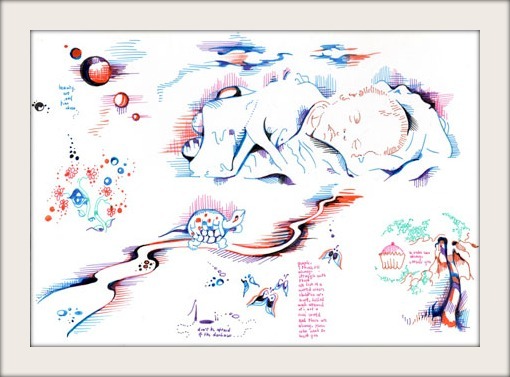 Drawing and painting my children helped me immeasurably. We are now a team. I made my first film with my children talking about mental health. They are aged 3 and 6, but they know so much about mental health, the foods they need to eat, the importance of sleep and how sleep is vital for their Mummy to keep well. I do everything for my children. All this work is for them, to give them the mental health knowledge that will fortify them and make them compassionate to others. Hopefully, they won't suffer like I did: they will be equipped. 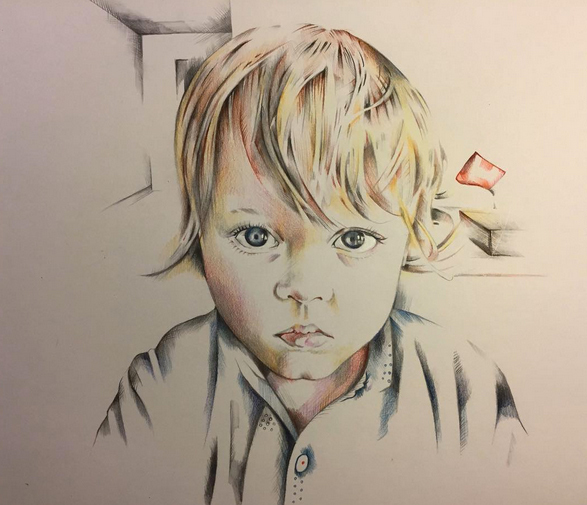 Sometimes I find it hard to be a mother, but when I draw my children I am connected to them through my pen and brush and pencil and my art. When I look at these drawings I can see that I love them with all my heart. If you are suffering right now, don't feel bad, it's not your fault, motherhood is hard, it is thankless, it is sometimes monotonous. It is not valued. It is the most important job in the world and mothers aren't getting the support they need the world over. They are dying because of maternal mental illness. Don't give up, everyday is a struggle for me, but I turn to my art not medication. Art, music, words, telling my children stories, making them laugh, telling them I love them even if I don't feel any love inside. This is how I cut through the barbed wire in my mind and get to the garden where I play with my children and fight another day."